Make a "sound sandwich" and discuss what makes the sound. Students can be instructed step by step on how to make the sound sandwich. Or, they are given a model at each table group to replicate - they need to use skills of careful observation and small manipulations. Loop the wide rubber band around one of the large popsicle sticks. Push the straw piece under the rubber band, near the end of the popsicle stick. Lay the second large popsicle stick over the first, sandwiching the straw (and small popsicle stick if used) between them. 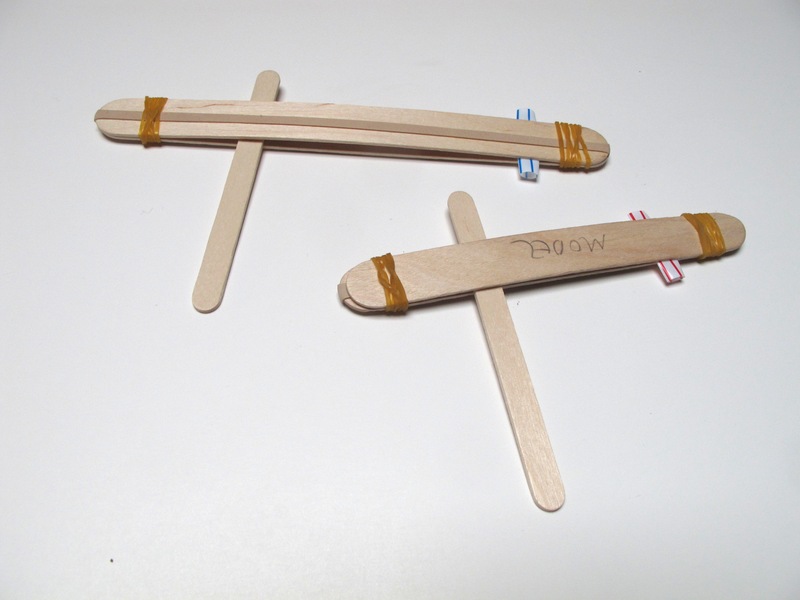 Wrap the small rubber bands around the ends, to strap the large popsicle sticks together. 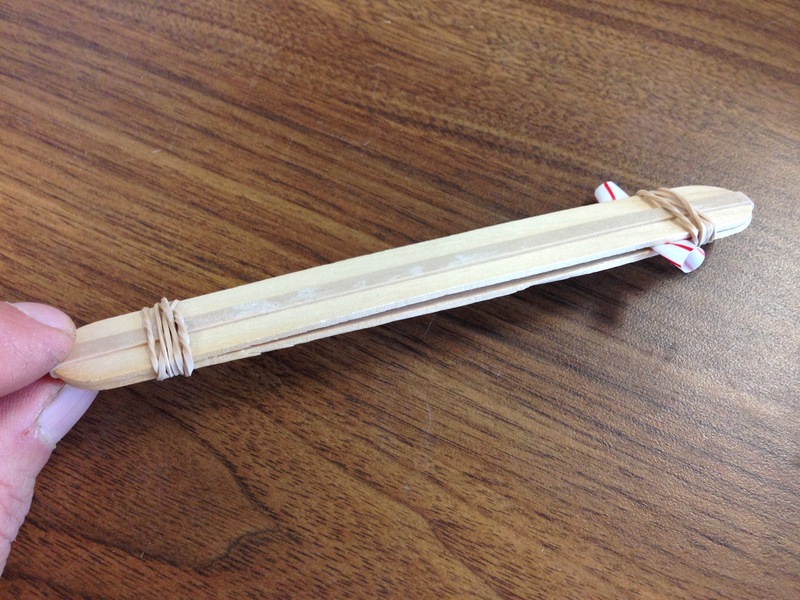 Blow through the large popsicle sticks to make the rubber band vibrate. Once they have made it and figured out how to make a noise, ask how they think the noise is made (and how we hear it). The sound can be changed by blowing harder or softer (makes the band vibrate at different frequencies, therefore producing a different pitch). Can you make a sound by sucking air through it? Needs revamping so that the gap between the popsicle sticks is wider. It easily stops working when they get a little bent when they get wet from blowing a lot. Temporary fixes: turn over one popsicle stick so that they bend the other way; double over the straw to make the gap wider. I modified the Exploratorium method, so that the tone can be easily changed (adding a popsicle stick instead of the second straw). Younger grades I skipped the small popsicle stick, to make a simpler noise maker. Some grade 1s were able to copy the model to make their own, with technical help adding the smaller elastic bands at each end.